Once again I left the city for the old house this weekend. I usually prefer express bus to train, as the bus is as punctual as the train and costs half the price. This weekend was an exception - as we departed by train Friday at 3.07 PM, and returned to Oslo 6.55 PM Sunday evening. And one good excuse to take the train is the bistro on rails. 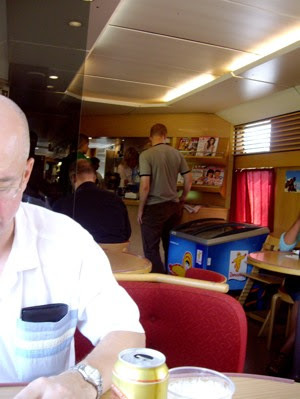 But dining on trains is not what it once was, it is a question of lost glamour. No white table cloths and elegant waiters, and gourmet food. Very understandable, as the standard on Norwegian train reflects a price we can afford to pay for a round trip ticket. 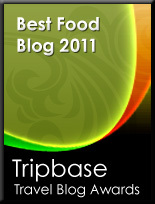 But cheap should not necessarily mean plain, because the food was plain. There must be better ways to prepare and serve ready made food than how they do it on board the NSB (Norwegian State Railway) train service from Oslo to Stavanger. On our way to Tvedestrand, we both ordered pizza - meaning a rectangular piece of fine bread with tomato sauce, ham, and cheese, served crisp and dry and what did it taste. Certainly not what was promised. I swear it would have been much better if I had sliced white bread myself, used ready made tomato sauce, cheese and ham and baked in the oven. A disappointment!! On our way back we ordered a pie. It is a serious question whether the thing served was a pie or something else. Still it was not made from crispy bread, but from real dough. 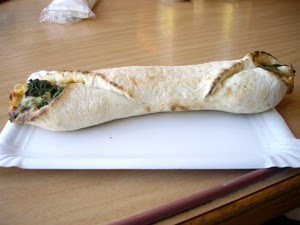 And under the crisp crust the luke warm filling did not really taste that bad. Still, luckily, I was not tempted by the "kjøttkaker med brun saus", the legendary meat balls with brown gravy every Norwegian brought up in a decent home compare to "the meatballs in brown gravy my mother used to make." 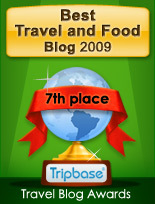 As you enter this competition be aware of the fact that you will be compared to the serious comfort food enjoyed by a whole generation. My mother would have turned in her grave. Seeing the staff taking out a round plastic bag with the cult food inside, placing it in a microwave and then simply snip a whole when serving it, made me reflect on how low the art of traditional cooking may sink!! WE (the happy and liberal crowd) enjoyed our beer on the wine down to Tvedestrand, and ordered red wine on our way back. 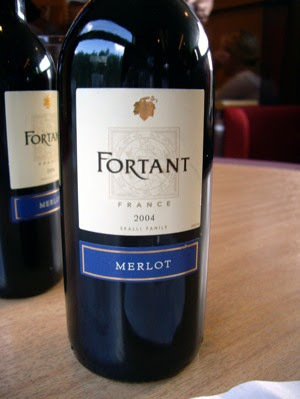 Fortant Merlot, a red wine from Languedoc made from 100% Merlot grape, served in overpriced 18,5 cl bottles. A whole bottle will, in the no fun zone, cost you €12, and we paid roughly the same price for the baby bottle. And did it taste well. Pretty decent, a deep purple colour and a strong blackcurrant character. But is it worth the price - I doubt it. Well, my conclusion is: Glamour certainly has gone out of train dining. Plain plastic wrapped food heated in a microwave oven is not my idea of decent dining, amd I would once again remind you that quick food does not necessarily mean boring food. NSB should have done a better job and served better and well prepared food on their trains. But maybe it all boils down that it is our own fault. If we, the travellers , had not settled for what is served, but had demanded better quality, there might have been quality food served on our plates. Well at least, we can hope that it might be!